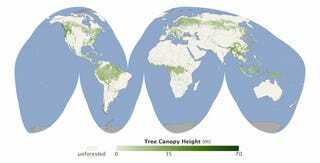 NASA has created a global snapshot of the world's forests using satellites and LIDAR, a laser technology that measures the height of forest canopy using pulses of light. This map took seven years and 250 million pulses to create. Humans release about 7 billion tons of carbon annually, mostly in the form of carbon dioxide. Of that, 3 billion tons end up in the atmosphere and 2 billion tons in the ocean. It's unclear where the last two billion tons of carbon go, though scientists suspect forests capture and store much of it as biomass through photosynthesis. There are hints that young forests absorb more carbon than older ones, as do wetter ones, and that large amounts of carbon end up in certain types of soil. But ecologists have only begun to pin down the details as they try to figure out whether the planet can continue to soak up so much of our annual carbon emissions and whether it will continue to do so as climate changes. "What we really want is a map of above-ground biomass, and the height map helps get us there," said Richard Houghton, an expert in terrestrial ecosystem science and the deputy director of the Woods Hole Research Center. Furthermore, the maps could aid researchers in determining the spread of forest fires. Colorado State's Michael Lefsky presented these results in the publication Geophysical Research Letters; you can read the full details and view massive versions of the above maps at NASA.